► Schedule an admissions campus tour. ► Schedule an art & architecture tour. Welcome to the student-created video tour of the University of Cincinnati. 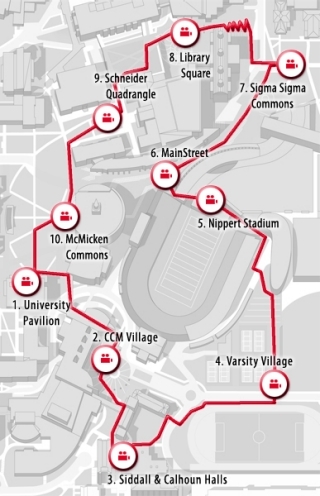 This tour provides a short glimpse at ten locations you would see on the in-person campus tour. Click on any icon on the map to jump to that location, or begin the tour at University Pavilion. Come see the campus for yourself! Register for a daily tour.